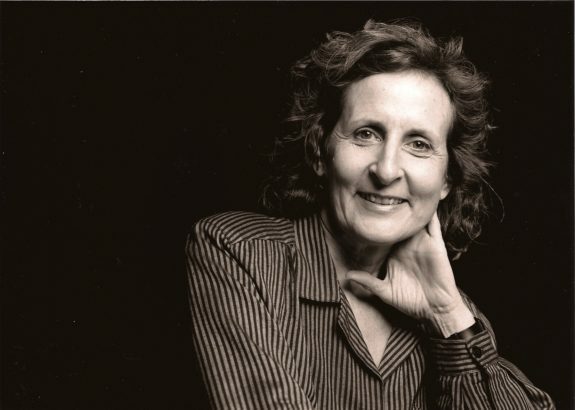 Trisha Brown’s death in March was sad, but it wasn’t a shock. She’d been declining into dementia for several years and had given up leadership of the dance company she’d led since the 1970s. What remains of her extraordinary career, besides the dances filmed and still being performed, is her almost reckless disregard for the boundaries of conventional dance and theater. Now that she’s broken the ground, others are following up on her discoveries, but it’s hard to think of anyone now who’s shaking up the norms as Brown did for nearly 50 years. Brown joined the workshops in dance composition led by Robert Dunn in the 1960s, precursor to the revolutionary movement known as Judson Dance Theater. When the first series of workshops ended in 1962, performances at Judson Church in Greenwich Village grew more inclusive, and the whole experimental dance movement spread out. Like others who’d been fostered by Judson, Brown continued making her work as an independent. Yvonne Rainer gathered some of the original workshoppers into the Grand Union, a free-floating dance company that didn’t do much dancing. It featured personal interactions, skits, theater games, props, dialogue, improvised movement, and any kind of dance and nondance, and was famously liberated until it disbanded in 1976. Rainer invited Brown into the group at the end of 1970. The other regular members, in addition to Brown and Rainer (who soon drifted away to pursue her own work), were David Gordon, Douglas Dunn, Steve Paxton, Barbara Dilley and Nancy Green. This collection of smart, strong, and utterly different personalities managed to act together to create spontaneous performances that were exposed, uncrafted, uneven—what dance historian Sally Banes called “surrealistic vaudeville.” There’d be hilarious bits, discussions, and long pauses while they thought up something else to do. Rainer’s dancers had become accomplished physical improvisers in dangerous maneuvers like falling and catching. Brown felt isolated at first, but eventually she could apply a “deadpan ironic humor” to initiating “absurd tasks that demanded what seemed to be aesthetically pointless physical risks,” according to scholar Marianne Goldberg. I don’t know if Brown ever came to enjoy improvising with other people in front of an audience. She certainly used the tactic later in her own work. What she wanted to do was dig deeply into movement, both the experience and the perception of it. By the beginning of the ’70s, she’d formed her own company and created several of the brainy pieces that became part of her lifetime biography: Homemade, Planes, Falling and Leaning Duets, Man Walking Down the Side of a Building, and the first in a series of Accumulations. Some of these, like the Falling and Leaning pieces, were open-ended experiments in handling one’s weight and sensitizing oneself to the weight of a partner. Others were ingenious studies in different ways of interpreting and perceiving movement. Homemade juxtaposed a live dancer with her own filmed image: Brown carried a projector on her back as she danced, bouncing the same dance, in black and white, off the walls and ceiling. Planes flattened out the dancers, whose spidery movements splayed from one foothold to another on a wall, inviting the viewer to overturn our idea of up and down. So did the equipment pieces Spiral, Walking on the Wall and Man Walking Down the Side of a Building. The Accumulating pieces built up a long series of quite simple moves one at a time with forty or so additions. Viewers could learn the dance mentally as the performer repeated the sequence. The anti-technical viewpoint of Brown and the other Downtown artists during that period appealed to me as a non-dancer. I began teaching movement classes for critics and other laypersons. My own training in Laban Movement Analysis convinced me that understanding your own movement would make you a better observer of other people’s movement; besides, I found the process personally rewarding. Believing that movement always reveals aspects of the mover beyond his or her physical action, I cajoled these civilians into moving and trying to understand the choices other movers were making. I invented improvisation exercises that anyone could do. Sometimes they were simple experiments, and sometimes they were more complicated. I’d propose problems, with part of the group moving and part observing. Then we’d discuss what we’d seen. In one favorite but simple exercise, I asked people with contrasting styles to start across a room together, figuring that the speedier person would get to the other side much sooner than slower one. But some movers would be more inventive. One took time to look into the corners; someone else might choose to crawl across instead of walking. The results of these improvised gambits were never the same and always a challenge to think about. I often adapted Downtown performances for these exercises because they too were simple events that could be done by dancers or non-dancers. Sometimes they woke up abilities that non-movers habitually suppressed or ignored. In Brown’s initial version of the Leaning duets, the partners would hold hands and brace against each other’s foot, trying to take a few steps together. Their mutual support would eventually give way; hands still clamped together, they’d break the fall against the cobblestones of Wooster Street with their free hand. I adapted this so that one person would lean against another person’s body until whatever they were using to stay upright failed and they fell together. The participants, with nothing else to attend to, would begin to understand the mechanics of their own bodies’ weight. In Brown’s Roof Piece (1971), movement was relayed from one dancer to another across half a mile of city buildings. For my adapted “Roof Piece,” I stationed participants to begin in a two-door studio, with the chain continuing in the corridor outside and back in through another door. At the end, those observing in the studio could see both the beginning and end of the telegraphed movement. They’d always be different, though the movers had been instructed to copy what they got as precisely as possible. Two other dances of this vintage that I used as teaching tools were Brown’s optical illusion Drift (a line of people steps sideways a few inches at a time so that by the time it gets across the floor, the line has shifted although it had appeared to be coming straight at the viewers) and Rainer’s “people wall” (a phalanx that moved across a public space, accommodating to whatever or whomever it encountered). I appropriated movements myself, from Brown and others, to choreograph a phrase for Tina Croll and James Cunningham’s “From the Horse’s Mouth,” at the 14th Street YMHA in 2000. After the Judson and Grand Union years, Brown’s choreographic interests turned to an extension of her own overflowing movement instincts. Gradually, her work moved out of the equipment and props business. The movement of the Wall dances—the Leaning and Falling duets, and Floor of the Forest (a physical investigation of articles of clothing strung on a horizontal grid, first done in 1970)—had been basically improvisational solutions to problems of her devising. Quite soon, though, maybe with the first Accumulation (1970), the movement itself became as interesting as the plan by which it was executed. With Locus (1975) the plan was complex and preset. In a version recorded in a studio at Mills College in 1977, Brown and three other women began in unison, facing in different directions. Derived from Brown’s elaborate drawing of a cube with numbers and letters assigned to specific points on the diagram, the dance was a series of moves that spread throughout the body, beginning with an arm or a leg lifting, a twist of the head or the hips. The twisting moves allowed the dancer to turn into another direction, and the stepping allowed her to travel. Every move was separately but not forcefully articulated. Some decision making was left to the dancers in performance. Aimed at different points in four imaginary cubes, the movement was seen by the audience from different angles like sculpture. Their shifting locations brought the dancers together into duets, canons and other quasi-choreographic forms without interrupting the sequence. I’m not sure Locus was the first time Brown engaged her intellect so thoroughly in the choreographic process, but it was the first time I couldn’t immediately discern the process from watching the dance that resulted. This compositional game-playing continued a year later in Solo Olos, a dance for the company, in which one member sat outside the performing area and instructed the others to change their movement in ways that rearranged the group in the performance space. Instant choreography, with the movements predesigned and the organization created by the dancer in the audience. Like all Brown’s work, it required not only technical ability, but acute intelligence and response time on the part of the dancers. Brown continued doing process pieces, keeping the movements relatively simple so that the structures on which they were laid could be perceived. There was a series based on the idea of lineup, which she would assemble for various performances, sometimes under the overall title of Structured Pieces (1973–1976). The Accumulations got more layered: As the dancers continued building up the movement sequence, other people would pick them up and move them, or they’d be performing while lying on the grass in a park or on rafts in a lake. Around the same time, Brown’s irrepressible dancing impulse began to take control. Even in Locus, where all the participants did the same directional, discrete phrases, her natural fluidity asserted itself. Though the moves were unrelated, in the Mills film Brown didn’t always come to a halt between them as her partners did. It was as if she couldn’t stop moving even when the phrase came to an end. In 1978, with Watermotor, she gave this instinct its way. After the second or third time, she wrote, “I danced how I dance . . . unpredictable, personal, articulate, dense, changeful, wild assed.” The first performance was at the Public Theater on 22 May 1978; I saw it there during its run of four shows. It looked absolutely daring to me at the time, revealing Brown’s unique ability to move with abandon and control simultaneously. You can see this in Babette Mangolte’s remarkable film, made around the time of the dance’s premiere. With every part of her body alive to the impulse, Brown juts and tilts, swings and springs into space. Although the choreography is fixed, nothing is stopped or placed. Even in Mangolte’s black-and-white document, you can feel Brown’s exhilaration, her trust in her body as she jumps, veers off center, follows a sudden thrust of her lower back into a new direction. Mangolte filmed the dance, then filmed it again in slow motion, aiming somehow to capture the disappearing images Brown created. In a fascinating essay, she has described her own preparation for making the film. A year later, as if merely dancing wasn’t enough to vent her physical and mental skills, Brown intercut movement with a verbal text. Accumulation with Talking Plus Watermotor was two dances and two stories spliced together, the one dance very precise and pure, the other highly excitable and elusive, with stories scripted in advance and some improvised insertions. For a catalogue published in conjunction with an exhibition devoted to her work at the Addison Gallery in Andover, Massachusetts, Brown wrote an account of the dance and provided a transcript of a performance she gave in Brussels in 1979. The transcript is sprinkled with numbers to indicate the times of performing and pausing. In her narrative, Brown says, “Talking while dancing is a ventilation for my mind.” Jonathan Demme filmed the dance at Brown’s studio in 1986. Here she had a tiny audience made up of company dancers arriving for a rehearsal and other insiders. Brown acknowledges them and reflects an obvious pleasure in her own performance. 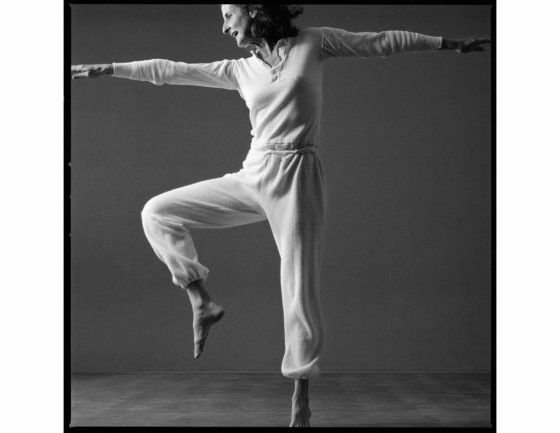 But my talk with Trisha Brown stayed with me. At that moment she was discouraged and exhausted and almost embarrassed to admit to an ambition that might not have been approved by her Downtown cohort. Sitting in the studio in a beige tailored blouse, with long unruly hair and no makeup, she said. “There are huge problems in choosing not to be in the mainstream.” She was tired of having to explain herself every time she made a new dance. “I’m beginning to think there’s a whole segment of the population, no matter what you told them they wouldn’t rise to it. They’re not interested in a kind of dance that isn’t entertaining.” She thought her dances didn’t get recognized for three or four years after they were made; obviously she couldn’t wait for the reception to catch up with her. She could only count on immediate feedback from her peers, who did understand. “I don’t like having to defend my position and to argue things that I thought were settled and resolved twenty years ago. I find it dispiriting and tedious and a waste of good energy to have to keep going back over those old artistic thresholds one more time, holding the hand of one more person. It . . .” Brown stopped, at a loss, shrugged, and smiled ruefully. The edited company performance on the film continues where it left off before cutting to the interview, in the middle of Bob Dylan’s “Early Mornin’ Rain.” The dancers in Spanish Dance are lined up in profile, stepping softly and propelling each other toward a wall, which they come smack up against, exactly with the end of the song. Brown soon moved her dance from pedestrian spaces to conventional theaters. When I reviewed Glacial Decoy (1979) at Brooklyn Academy’s Opera House in the fall of 1981, I missed the formal declarativeness of the earlier Brown. Robert Rauschenberg’s enormous photographs of light bulbs, bicycle tires, windmills, fruit stands, sliding across the background on four proscenium-high screens, were so mundane, so literal, I couldn’t help paying attention to them. Rausch­enberg’s costumes for that dance were calf-length white dresses in some stiff, accordion pleated material, with bib fronts and backs, and armlets that reached to the dancers’ forearms. You couldn’t see the refinements of the torso under these voluminous garments, but you could see big angles—legs lifting, directions changing. Glacial was followed by other spectacular theater pieces. 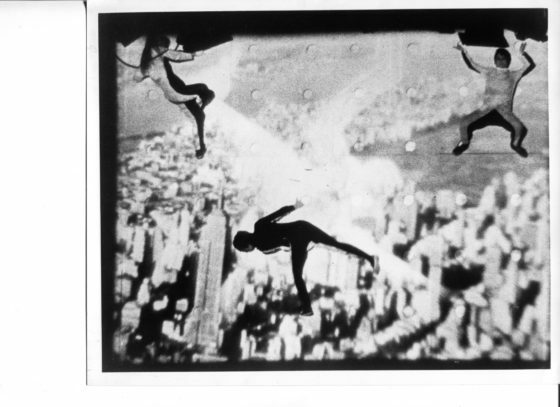 In Set and Reset (1983), the dancers moved in and out of the sides of the stage, wearing Rauschenberg’s near-transparent, silkscreened costumes, and Laurie Anderson chanted a kind of mantra on the words “Long time no see.” In Lateral Pass (1985), there was a dancer flying on a harness among the other dancers, and the navigational hazard of several large set pieces by Nancy Graves that dropped in and flew out. Astral Convert­ible (1989), another Rauschenberg production, made the dancers part of the environment, with a stage full of sound sensors and lights that got activated by their motion. Opal Loop (1980) had Fujiko Nakaya’s floating fog banks, but as the dancers appeared and disappeared in that beguiling landscape, I lost track of their movement. In Foray Forêt (1990), an invisible marching band circled outside the theater, changing the sound that accompanied the dancing. For part of this piece, the company danced in the wings, offstage. Each new theater dance posed a new challenge that Brown gave herself, the company and the audience. I left New York in 1996, and after that I had few chances to see her performances. Over the next years, I struggled to fathom what was below the surface of her new glossiness, knowing I would only get one chance to see the work. I realize now that I was looking at Brown’s theater dances through a paradox. The proscenium frame induced a longing for unity that I had resisted since first looking at Merce Cunningham’s work in the ’60s. Trisha herself and the other postmodern dancers had insisted on the necessity of looking closely at movement, however odd or ordinary, and I wanted to do that. I was attracted to the ordinary—I respected the performance of plainness. And I loved Brown’s commitment to struc­ture. With If You Couldn’t See Me (1994), she returned to the stark, in-place presentation she’d begun with the first Accumulation. She turned her back on the audience for the entire dance. I sometimes thought this was a reflection on another postmodern icon, Yvonne Rainer’s 1966 Trio A. But Brown’s dance acquired its own glamour when two stars, Bill T. Jones and then Mikhail Baryshnikov, asked if they could learn it. In the ’90s she was also developing two more aspects of her big array of talents: drawing and music. I saw Winterreise (2002) with some ambivalence. Baritone Simon Keenlyside and the three dancers seemed to be at odds with the Schubert song cycle, but I could resolve the conflicting romanticism of the music and the angular shaping of Keenlyside and the dancers as a way of conveying but not overplaying the music. Brown had worked on a number of operatic works by then, and she was looking for a way to energize what she saw as the static behavior of singers. Her drawings were featured in a 2008 show at the Walker Art Center in Minneapolis, part of a yearlong celebration of Brown’s work. More than 50 graphics were reproduced in the Walker’s catalogue (Trisha Brown: So That the Audience Does Not Know Whether I Have Stopped Dancing, 2008). They are witty and full of motion. She drew her right hand with her left and vice versa. She drew swirls with her feet. She applied herself bodily to large sheets of paper. After Brown stopped dancing, she continued to make dances until 2011, and the company carried on. Since her death, under the direction of longtime dancers Diane Madden and Carolyn Lucas, it has been touring, reconstructing and “re-siting” dances, and maintaining the company archives. They will be performing at Jacob’s Pillow this summer (16–19 August). Trisha Brown’s dance made a singular impression, but it’s hard to remember specifically what she did. She told Yvonne Rainer in a 1979 interview: “I’m always trying to deflect your focus.” Most photos of her show her aiming in several directions at once, but they’re deceptive. They make her dancing look static when she never was still. I’ve never seen such a fluent body. Yet she didn’t look as if she was just flinging herself around. I felt she always knew where she was going if not where she would stop. A great talker who loved metaphors, in words and movement, Brown spoke often about dancing in some supernatural dimension: levitation, superimposition, disappearance. Almost from the start, she choreographed about getting off the ground, and I bet she never stopped thinking she could fly. 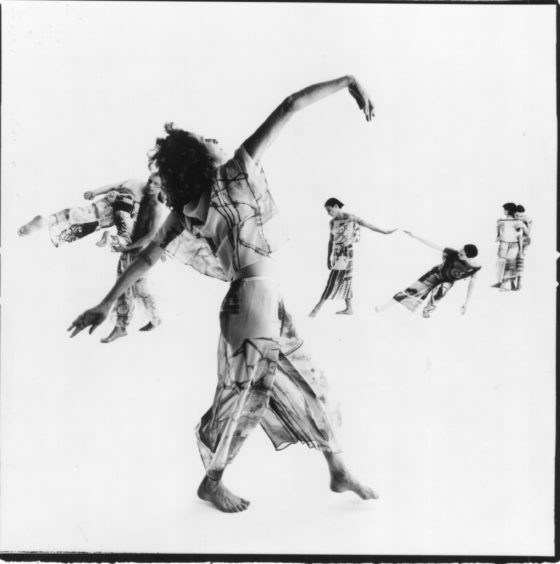 This and other pieces are documented on the two-disc album Trisha Brown Early Works 1966–1979, from ARTPIX.org. A video of Set and Reset is currently on view at the Museum of Modern Art exhibition “Robert Rauschenberg: Among Friends” through September 17, 2017. The performance took place at the Brooklyn Academy of Music, January 29, 2016. Arts Review from the Summer 2017 issue.